Charles Draper was born on October 2, 1901 in Windsor, Missouri. He earned his BS from Stanford, and then his MS and PhD from the Massachusetts Institute of Technology. Upon graduation in 1938, Dr. Draper quickly became a full professor in aeronautical engineering at MIT, where he established the Instrumentation Laboratory, which would eventually leave MIT and become the Charles Start Draper Laboratory in 1973. 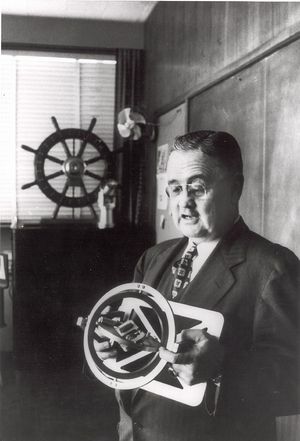 During World War II Dr. Draper developed anti-aircraft fire control for the Navy and fire control systems for the Air Force. Both systems were in wide use throughout the war. After the war, Dr. Draper’s Instrumentation Lab at MIT created inertial guidance systems for aircraft, subs and missiles. But Dr. Draper's claim to fame came years later. In 1961 he was awarded the contract to develop the navigation computers for the Apollo space mission, and his design successfully guided the Lunar Excursion Module through six moon landings. For his contributions to the nation’s space program, Dr. Draper was awarded the National Medal of Science; he was also inducted into the National Inventors Hall of Fame in 1981. He received the IEEE Lamme Medal in 1973. The Charles Stark Draper Prize of the National Academy of Engineering is awarded annually in his honor. Charles Draper died on July 25, 1987. This page was last edited on 20 January 2016, at 18:00.